Looking for the best drugstore eyebrow pencil? I’ve got 5 options you should try. All are affordable and perform just as great as their high end competitors. Look out, Anastasia Brow Wiz. I think we’ve broken up for good. I remember when the Anastasia Brow Wiz came out and changed the brow game. It was my holy grail eyebrow pencil that I swore I never would stray from. At the time, it was a revolutionary product. The tiny micro-fine pencil really allowed you to sculpt, define, and even draw little hair-like strokes into the brows. It truly was a game changer for me and for many. Over the years, the drugstore brands caught on and have since released lots of brow products. I discovered the NYX Micro Brow pencil, dubbed it as my favorite Anastasia Brow Wiz dupe, and the rest is history. It used to be so hard to find a great brow product while perusing the aisles of the drugstore, but now I don’t even bother buying high end brow pencils. So many great options. Not to mention, I burn through them so quickly, it saves me quite a bit of money. I am the type of person who prefers the fine/micro type of eyebrow pencils, so that’s what we’re going to focus on here today. There are also some great pomades and brow gels available, but I suppose that’s another story for another time. Feel free to leave a comment or email me if you need a recommendation! Looking for the best drugstore eyebrow pencil? I’ve got 5 options for you to try. I’ve linked everything at ULTA for you to make shopping easier! I have to say, out of all of these, I wouldn’t recommend one over the other. They really all are so similar (formula wise!) and you can’t go wrong with any of them. I am giving you these options so you don’t feel as limited while at the drugstore, and you’ll be able to grab one for the best price! I know shade ranges may matter a bit here, especially if you’re a blonde, red head, or have almost-black hair so I will be giving details on that! This drugstore eyebrow pencil comes in 5 shades – Blonde, Dark Blonde, Light Brunette, Brunette, and Dark Brunette. I don’t think it’s the most comprehensive shade range, although they do not ever pull too warm-toned on me. I use shade Brunette in this pencil. This pencil comes in 8 shades – Taupe, Blonde, Auburn, Chocolate, Ash Brown, Brunette, Espresso, and Black. It is the most expensive drugstore eyebrow pencil on this list, but it does have the widest shade range. I feel like they nailed it there! This one comes in 4 shades – Blonde, Soft Brown, Deep Brown, and Auburn. Not much for the in-between brunette shades, but it does cover the blondes and red heads. This one definitely wins with price and shade range! If I reeeeeeally had to pick a favorite, it’d be this one. This baby comes in 10 shades – Blonde, Taupe, Soft Brown, Auburn, Warm Brown, Medium Brown, Brunette, Espresso, Blackest Brown, and Black! I’m just saying… the Brow Wiz comes in 10 different shades. So perhaps this should be crowned my new favorite dupe! I really like how this one has options for warmer and cooler tones. The only thing is – L.A. Girl is a little harder to find in stores. I don’t see it in a lot of drugstores, but it is for sure in ULTA. And can we also talk about the name of this one? It’s my fave. Haha. The shade range with this is a little lacking (okay, a lot lacking), but if you’re brunette and this is the only eyebrow pencil you see in the drugstore, grab it. They for sure make 4 shades of this, but I’m only seeing 3 online at ULTA right now. They do manufacture the shades Soft Blonde, Soft Brown, Honey Brown, and and Rich Brown. The next time you’re at the drugstore or shopping on ULTA.com, don’t get overwhelmed. I’ve got you. I hope you’ve found this post helpful! Let me know if you’ve got a favorite drugstore eyebrow pencil not on this list? I’d love to try it out if I haven’t already! Love this post? Make sure to check out some of my other drugstore beauty blog posts! 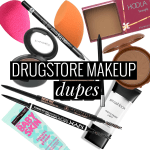 …or browse all of my drugstore content HERE! Great post and I love how user friendly your site it!